Taimur Ali Khan's pictures are here to make a splash on the internet. The little Nawab of B-town never really ceases to amaze his massive fan following. After all, such is his cute charm and stylish looks! 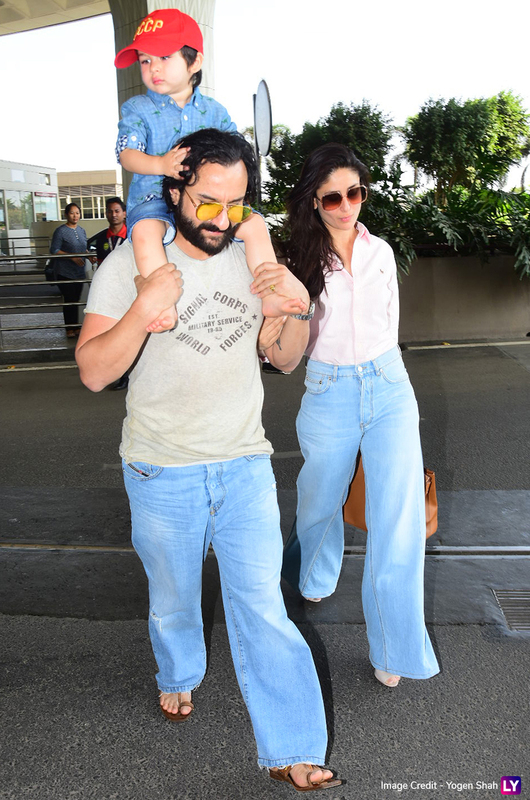 Recently, Taimur was spotted with his dad Saif Ali Khan and mommy, Kareena Kapoor Khan. Before we talk about how stunning Bebo looked, we will first take a look at the adorable Taimur's summer look for the day! 'Sun' Taimur Ali Khan's First Drawing is Dedicated to Mommy Kareena Kapoor Khan-View Pics. Unlike every day, today was different for Tim. He was in no mood to wave or stick his tongue out towards the paparazzi. In fact, he was all grumpy and in a lazy mood, as he got a ride on his papa's shoulders at the Mumbai airport. 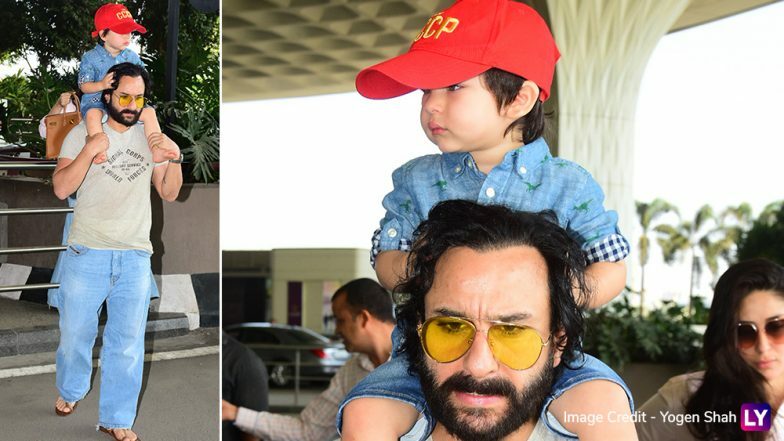 This Time It’s Not Taimur Ali Khan but Saif Ali Khan’s No Chappal, Not-So-Impressive Attire Grabs Netizens’ Attention - See Pic. The 2-year-old toddler wore a pair of denim shirt and pant. He stole all the attention, looking uber cool in his red cap. Also, his expressions will just melt your heart! While, Saif was in his usual modish but IDGAF avatar, Kareena looked gorgeous in a baby pink shirt paired with blue jeans. Really, how does she manage to look so beautiful, every damn time? Check out the pics below. We don't know what is brighter- Tim's cap or Saif's glasses? Clearly, not in a mood to pose! Take a moment to appreciate the beauty of B-town! On the work front, the stylish actress is soon to be seen in a film based on pregnancy, known as Good News. Also, she has been roped in for Karan Johar's directorial period drama named Takht. Then, in a surprising turn of events, she has been finalised for Irrfan Khan starrer Angrezi Medium (Hindi Medium sequel) that also has actress, Radhika Madan in a vital role. So, while all this is on the platter for Bebo, she does not leave a single chance to be with her young son.